Leaf: 660 x 460 mm; initial: c. 160 x 150 mm. 6 four-line staves ruled in red with square musical notation. A splendid and excellently preserved, very large leaf from a liturgical codex. The artist is yet unknown but ranks among the best Lombard artists from the end of the 15th to the beginning of the 16th century. This leaf is an important contribution to exponent of the art of Renaissance illumination. Christ hovers over a smooth, green hill, about to ascend into heaven. He is dressed in a pale violet gown and a grey tunic. His facial expression is more contemplative and sorrowful than triumphant. Among those observing the miracle, one can distinguish St. John “the beloved”, the Virgin Mary, and St. Peter with his key. The other followers are clustered in the background. The miniature’s palette is generally more subdued than the bright, vivid colours of the letter’s body and of the border decoration, both of which boast an intense interplay of red, green, yellow, orange, and different hues of blue. In some aspects, the miniature recalls the style of the renowned illuminator Fra Antonio da Monza (active in Milan and Rome from 1490-1528, see also the Resurrection leaf on this website). Antonio was a native of Monza, outside of Milan, and a member of the Franciscan Order. Very little is otherwise known about the biography of this highly esteemed Renaissance artist. His work was certainly influenced by Leonardo da Vinci. Some single leaves and books are attributed to him, for instance in the Sforza Hours and in a copy of Antonio Minuti’s Life of Muzio Attendolo Sforza. 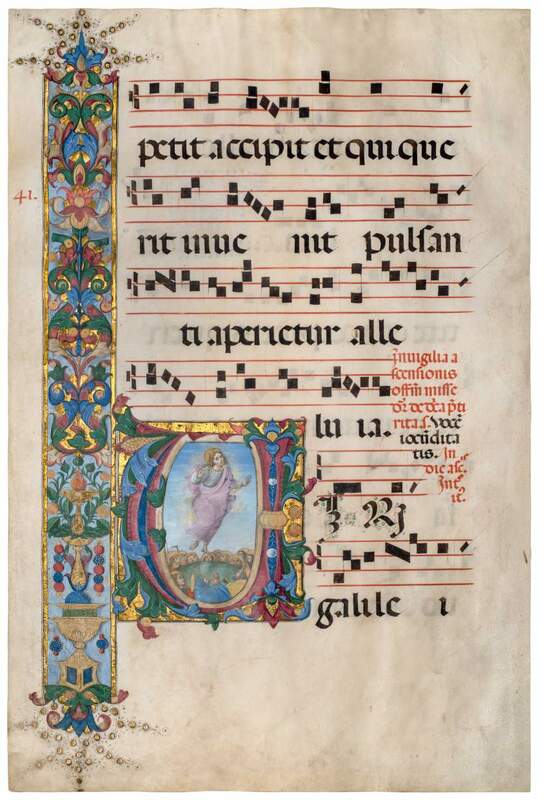 This large leaf comes from a choir book, a liturgical manuscript consisting of several volumes. It is hard to image the original book and the price of such a commission if one takes into consideration how many high-quality vellum skins were needed for a work of such scale, and how many hours of labour were involved in the creation of such a large manuscript.